DML has now released a new “Gen 2" set of four figures equipped with this weapon; one set of “in action” figures is wearing greatcoats and firing from a standing position; the other is wearing normal combat dress with soft caps and in route march. Each figure follows the normal breakdown of “Gen 2" figures - 17 parts consisting of head (2), torso (2), legs (2), arms (2) hands (2), footgear (2), collar (1) and coat tail or skirt (4). All are new molds but there are no optional hands or arms to place the figures in different poses. The kit provided is from the now normal generic sprues GA and GB and should be familiar to all those who have seen the Gen 2 figures, and also the WA sprue with two Kar 98Ks and accessories is included. A small fret of etched brass provides the slings and optional belt buckles and shoulder straps. 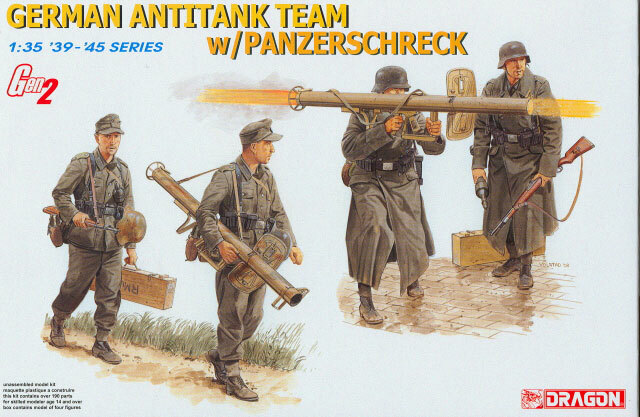 This kit also includes two WE sprues, each of which comes with a Panzerschrek with four rounds, an ammo carrying case, and optional parts for early or late versions of the weapon. The tails of the rocket projectiles are “Slide Molded” so have internal detail, as is the carrying case which comes with a separate lid. Finishing directions – like the box art – are from Ron Volstad. There is a small sheet of Cartograf decals included for the two carrying cases and the Panzerschrek weapons. Overall this looks to be another nice and useful set of figures, but the fact that the firing team is in long coats pretty much puts them in the winter of 1944-1945.